. This means they do not easily take part in chemical reactions. 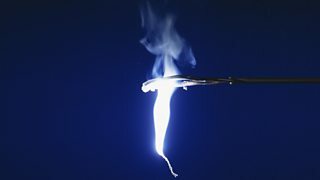 For example, platinum does not react with oxygen in the air, even if it is heated in a Bunsen burner flame.
. They easily take part in chemical reactions to make new substances. "Pond slime can make a zoo interesting - the long crinkly sort goes purple."